This article is about the currently operating subway. For the former Los Angeles rail system known as the "Red Car", see Pacific Electric. The Red Line is a heavy rail subway line running between Downtown Los Angeles and North Hollywood via the districts of Hollywood and Mid-Wilshire. In North Hollywood it connects with the Orange Line (bus rapid transit) service for stations to the Warner Center in Woodland Hills and Chatsworth. It is operated by the Los Angeles County Metropolitan Transportation Authority. The Red Line, which is one of six lines forming the Metro Rail rapid transit system, opened in stages between 1993 and 2000. Together with the Purple Line, these two heavy rail lines combine to form L.A. Metro Rail's busiest line. As of October 2013[update], the combined Red and Purple lines averaged 169,478 boardings per weekday. The Red Line is a 16.4-mile (26.4 km) line that begins at Union Station and travels southwest through Downtown Los Angeles, passing the Civic Center, Pershing Square (near the Historic Core) and the Financial District. At 7th St/Metro Center, travelers can connect to the Metro Blue Line and Metro Expo Line. From here, the train travels between 7th Street and Wilshire Boulevard (and briefly Ingraham Street) west through Pico-Union and Westlake, arriving at Wilshire/Vermont in the city's Mid-Wilshire/Koreatown district. Up to this point, the track is shared with the Metro Purple Line: at Wilshire/Vermont, the two lines diverge. From here, the Red Line travels north along Vermont, and then west along Hollywood Boulevard, traveling through Koreatown and Hollywood. Finally, the line turns northwest and crosses into the San Fernando Valley, where it terminates in North Hollywood. This route matches a branch of the old Red Car system, dismantled during The Great American Streetcar Scandal. The current Red Line is the product of a long-term plan to connect Downtown Los Angeles to central and western portions of the city with a heavy rail subway system. Originally planned in the 1980s to travel west down Wilshire Boulevard to Fairfax Avenue and then north to the San Fernando Valley, a methane explosion at a Ross Dress for Less clothing store near Fairfax in 1985, just as construction got underway, led to a legal prohibition on tunneling in a large part of Mid-Wilshire. Instead, after some wrangling, a new route was chosen up Vermont Avenue to Hollywood Boulevard. MOS-1, which consisted of the original five stations from Union Station to Westlake/MacArthur Park, opened on January 30, 1993. 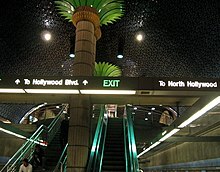 MOS-3, which added new stations and extended the Red Line from Hollywood/Vine to its final terminus at North Hollywood, opened in 2000. The route currently known as the Red Line was originally intended to continue beyond its eastern terminus at Union Station to East Los Angeles. At the north end of the route, the Red Line was to turn west from North Hollywood station toward Warner Center. Trouble during the Red Line's construction, including a 1995 sinkhole that led to the project switching to a new contractor, led to a 1998 ballot proposition that banned revenue from existing sales taxes being used to dig subway tunnels in Los Angeles County, which put an end to expansion of the Red Line for the then foreseeable future. The route to Warner Center was turned into the Orange Line, a bus rapid transitway (BRT) service. Former Mayor Antonio Villaraigosa has mentioned extending the Red Line from its current North Hollywood Station terminus along Lankershim Boulevard to the northeastern San Fernando Valley, with a terminus in Sylmar. One long-term possibility might be an underground extension of another mile or two to a future high-rise housing district, or to a multi-modal transportation hub station at Bob Hope Airport in Burbank, a distance of approximately four miles. It would possibly go under Oxnard Street, the NoHo West development, Laurel Canyon Blvd, and Vanowen Street to the Burbank Airport. In 2006 a large number of housing units, including a high-rise tower was completed very near the North Hollywood (NoHo Arts District) station. Planned high-rise housing developments further to the north, including the NoHo West development which broke ground in March 2017 and the possibility of establishing a direct connection to the planned California High-Speed Rail station at Burbank Airport have been suggested as additional justification for an extension of the line from its current terminus in North Hollywood. In 2010, at the request of L.A. City Councilman Tom LaBonge, Metro staff studied the possibility of adding a station along the west bank of the Los Angeles River to 6th Street and Santa Fe Avenue. The study concluded that such an extension, completed at-grade along Metro-owned right-of-way, could be completed for as little as $90 million. The study suggested an alternative station at the Division 20 Yard north of 4th Street and Santa Fe Avenue. This station would be closer to the residential population of the Arts District. As new turnback tracks will need to be built as part of the Purple Line Extension (to allow shorter headways), this Arts District extension could possibly be partially completed as part of the Purple Line Extension project, lowering the incremental cost of the station while increasing its usability. Plans of extending the Red Line to the Eastside have been set aside with opening of the Metro Gold Line East extension to the neighborhoods of Boyle Heights and East Los Angeles in 2009. Although there are no plans to do such, it is conceivable that plans for a future eastward extension could involve the San Gabriel Valley rather than the Eastside. Some citizen proposals have included the conversion of the El Monte Busway to heavy rail, although this would disrupt the existing bus and Metrolink service along that corridor. Other rights-of-way that could host a Red Line extension, whether subway or at-grade, include the Union Pacific's Alhambra Trench, the former Pacific Electric two-track right of way extending through the City Terrace area to El Monte and Covina, and the median of Huntington Drive, which also held a two-track Pacific Electric line extending as far as Azusa & Glendora, until 1951, when it was removed. Metro is currently constructing the Purple Line Extension (formerly known as the Westside Subway Extension project) to extend the Purple Line (originally part of the Red Line) westward, to the Westside. The Red Line uses Breda A650 75-foot (23 m) electric multiple unit cars built by Breda in Italy; these trains are based off similar vehicles that were built by the Budd Company for the Baltimore and Miami rapid transit systems between 1983 and 1986. Trains usually run in six-car consists during peak hours and four-car consists outside of peak hours. The acceleration for cars #530 and up is similar to that of cars used by the Washington Metro because they both use General Electric traction motors. The cars are maintained in a Metro yard on Santa Fe Avenue near 4th Street alongside the Los Angeles River in downtown Los Angeles. On December 22, 2006, a transient accidentally spilled a vial of mercury on the platform at the Pershing Square station. He then located a passenger information intercom and told the operator that he spilled mercury before boarding a train. The Los Angeles County Sheriff's Department was not notified until the next day, eight hours later. Metro has responded since the incident by giving hazardous materials (Hazmat) training to its field employees and operators so they can identify hazardous substances and take correct action in the future. On the CBS crime drama Cold Case in the episode "Creatures of the Night" Mike Cahill is murdered at the Tasker-Morris SEPTA station which is acutally the Los Angeles Union Station stop and the murder takes place as a speeding train passes the station. ^ a b "Ridership Statistics - Rail Ridership Estimates". Los Angeles County Metropolitan Transit Authority. August 20, 2013. Retrieved August 25, 2013. ^ a b "Monthly Ridership Plot" (PDF). Los Angeles County Metropolitan Transit Authority. November 2013. Retrieved November 16, 2013. ^ a b "Regional Connector Transit Corridor Project Contract No. E0119 – Operations and Maintenance Plan (Final)" (PDF). 2.1 Metro Light Rail Overview. Los Angeles County Metropolitan Transit Authority. September 10, 2013. pp. 2–1. Retrieved May 19, 2017. The Red Line operates 16.4 miles between Union Station in downtown Los Angeles and North Hollywood. ^ Newton, Damien (20 November 2018). "Metro Moves Ahead with Changes to How They Name Rail/BRT". Streetsblog LA. Retrieved 14 December 2018. ^ "Red & Purple lines timetable" (PDF). Los Angeles County Metropolitan Transit Authority. December 11, 2016. Retrieved June 11, 2018. ^ "Metro Bus & Rail System Map" (PDF). Los Angeles County Metropolitan Transit Authority. December 2013. Retrieved January 15, 2014. ^ Masters, Nathan (2016-02-23). "When a Methane Explosion Derailed L.A.'s Subway Plans". KCET. Retrieved 2019-02-25. ^ Katches, Mark (January 31, 1993). "Red Line Rolls to Raves – It's Smooth Railing As L.A. Subway Opens". Los Angeles Daily News. ^ Hiestand, Jesse (June 13, 1999). "Hollywood Subway Picks Up Rave Reviews". Los Angeles Daily News. ^ Sheppard, Harrison (June 18, 2000). "End of the Line". Los Angeles Daily News. ^ GORDON, LARRY; KENNEDY, J. MICHAEL (June 23, 1995). "Street Vanishes in Subway Sinkhole : MTA: Burst water main weakens earth above tunnel, causing half a block of Hollywood Boulevard to collapse" – via LA Times. ^ Garland, Chad (23 July 2015). "Study outlines potential transit improvements at Bob Hope Airport". Los Angeles Times. Retrieved 9 July 2017. ^ "Feasibility study" (PDF). media.metro.net. June 16, 2010. ^ Nelson, Laura J. (March 18, 2015). "Metro could expand subway service to the downtown L.A. Arts District". Los Angeles Times. ^ Sampson, Rich. "Two Rail Lines, One Mission: Connecting Southern California" (PDF). RAIL Magazine (22). Washington, DC: Community Transportation Association of America. Retrieved 14 March 2016. ^ Bluelineexpress (April 9, 2007). "Civic center departure" – via YouTube. ^ "L.A. Metro inks pact with CRRC for up to 282 new rail cars". Progressive Railroading. March 24, 2017. Retrieved March 24, 2017. ^ Blankstein, Andrew; Guccione, Jean (January 19, 2007). "MTA admits subway spill errors". Los Angeles Times. Retrieved February 2, 2007. ^ Blankstein, Andrew; Guccione, Jean (January 24, 2007). "Transient held in MTA mercury spill". Los Angeles Times. Retrieved January 31, 2007. ^ Powell, Amy (August 19, 2011). "Passenger fatally stabbed on Metro Red Line". KABC-TV. Retrieved February 1, 2016. ^ "Man rescued from under Metro Red Line train at North Hollywood station". Los Angeles Daily News. September 4, 2012. Retrieved September 9, 2012. ^ "Death Of Man Rescued From Underneath Metro Red Line Train Under Investigation". KCBS-TV. September 5, 2012. Retrieved September 9, 2012. ^ "Man who 'probably jumped' in front of Metro Red Line train dies". May 22, 2018. Wikimedia Commons has media related to LACMTA Red Line.